TrustNet is an interesting project. It is meant to replace the existing Rating system within Second Life with a twist. The important thing is that you don’t have global ratings but you see each person rated from your point of view. Let’s take an example. Person A rates Person B positively. Now Person A sees 10 points for B. Now person C comes around and checks the ratings for person B as well. C now sees 0 points because he hasn’t rated person B yet. If person C votes person A positively then he also get’s access to person A’s votes and thus person B now shows up with 1 point. Thus you see ratings relative to your own ratings. The implementation is done via a HUD. It scans your surrounding for avatars and show them with their respective rating. If you want to rate an avatar you simply click it’s name and a dialog menu appears in which you can choose to rate or to do other actions such as ejecting it from your land, unsitting him and so on. The whole system is backed by a web-based database which will also have an web-based frontend. It is distributed as subscription system and you can buy a subscription here. The Elemental is a multi-purpose vehicle and can transform itself into various forms such as and airplane, an airship, a helicopter, a motorcycle and so on. It also has various combat systems built in such as CCC and others. Additionally you can change it’s color, the license plate and much more. Everything is HUD controlled and updates will come automatically. And the best: it is free. You can either get your Elemental by clicking another person’s one or you can just go here and get one. the World Vision spot in Second Life and select one or more of several gifts from their website greatgifts.org which in turn get shipped to that region which needs it most. Articles range from non-expensive gifts like a library card for a child (£ 6) up to a grinding mill (£ 3660,-). So there should be something for every pocket. This project is done by World Vision, one of the world’s leading relief, development and advocacy organisations, currently helping more than 100 million people in almost 100 countries. In Second Life they are represented by a virtuak village in which you can walk around and see some of the gifts possible in action and purchase is directly via a link to their website. Just a quick note for those who might wanna join. 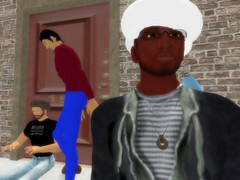 It’s happening right now in the Millions of Us sim and Talib Kweli is just having a little chat with about 35 avatars. No music unfortunately but he says that he wants to do a show and that he likes Second Life a lot (well, all people say that when they appear the one and only time in SL but who knows :-). In the Financial Times Germany there was a supplement this morning called “Karriere & Zukunft” (career and future) and it had a listing of the top 5 favourite employers of germans by sector and by what you’ve studied. It was created by The Universum Graduate Survey. So I wonder: What would be your favourite employer in Second Life?